The Good Dinosaur is now playing in US theaters. Have you seen it yet? Certified “Fresh” by RottenTomatoes.com, Disney-Pixar’s The Good Dinosaur is a humorous and exciting original story about Arlo, a lively Apatosaurus with a big heart. 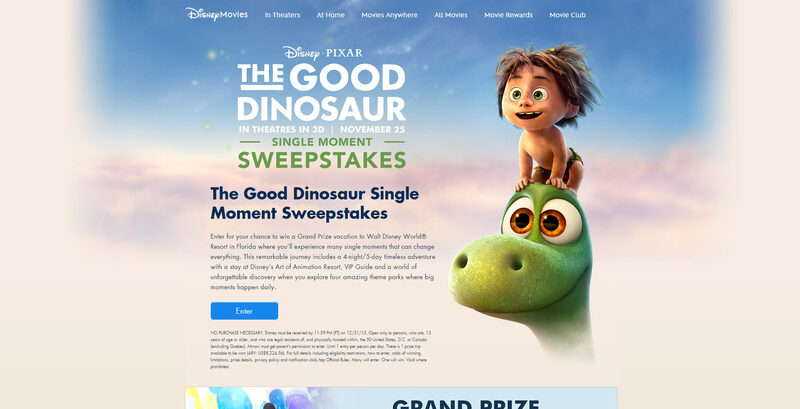 To celebrate the release of their newest family entertainment movie, Disney and Pixars bring you The Good Dinosaur Single Moment Sweepstakes! For your chance to win, visit disney.com/GoodDinoSweeps and enter using your Disney Member username and password. Just like Arlo, you could set out on a remarkable journey! As the Grand Prize Winner, you will receive a 5-day/4-night vacation package for a family of four to Walt Disney World Resort in Florida, complete with roundtrip airfare, on-site hotel accommodations, Disney VIP Guide for 1 day, a $500 Disney gift card, and so much more! States, D.C. or Canada (excluding Quebec).